Haha big +1! Your board looks so similar to ours! After a year we have now built our own online whiteboard and work on stories through bugs. I like the way I can link them with submitted change lists, but then the pleasure of putting up/ taking down the posit is lost! 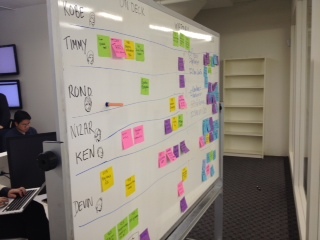 Process retrospectives help a lot as well, when done once a quarter or so.